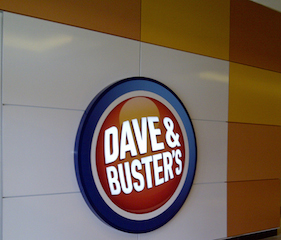 Dave & Buster’s Vernon Hills, Illinois new location presents a sleek, modern brand inside and out. Designed by Aria Group Architects, the store’s updated look conveys a sense of energy, technology and fun befitting the combined retailer, restaurant, sports bar and gaming center. 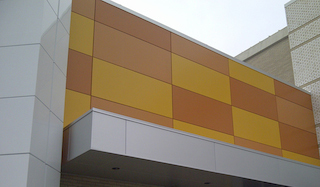 Achieving the desired aesthetic balance, the store’s exterior features bold blocks of colorful metal panels provided by Laminators Inc. and finished by Linetec using a 70 percent polyvinylidene fluoride (PVDF) resin-based coating. Founded in 1982 and headquartered in Dallas, Dave & Buster's Entertainment, Inc., is the owner and operator of 76 venues in North America that combine dining and entertainment. Aria Group assisted with more than 10 of these. The 68th Dave & Buster’s in the U.S. and the fourth in the Chicago area, the Vernon Hills location’s 40,000-square-foot restaurant and entertainment center was completed in March 2014 as part of an expansion of the Westfield Hawthorne Mall. 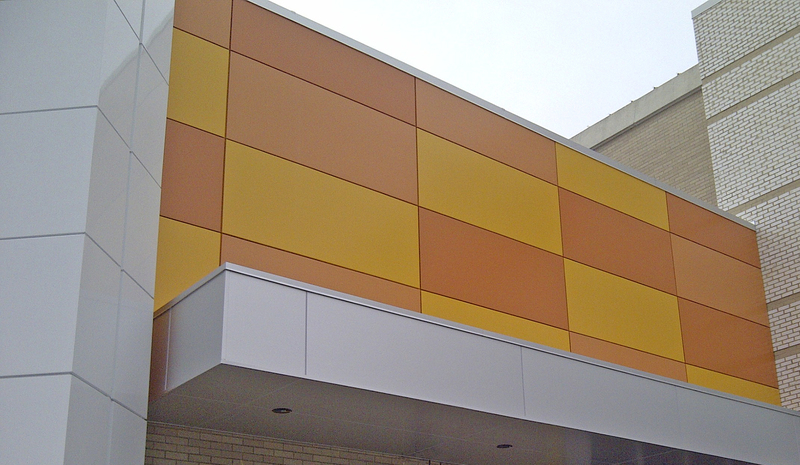 Meeting the owner and architect’s precise specifications, Linetec painted Laminators’ Omega-Lite® aluminum composite panels in Valspar’s Fluropon® two-coat finishes to match Dave & Buster’s identity standards. Three custom colors were specified: Ionic Sunflower, Yam and Cornucopia Tan. For each color, 30 to 35 panels in up to 121-inch lengt hs were used, totaling approximately 3,900 square feet. Composed of a polypropylene, corrugated core between two finished aluminum sheets, Omega-Lite panels are non-absorbent, water-resistant, and easy to maintain. Supplied by distributor S&S Panel Sales, the panel system was installed by Metalmaster Roofmaster using Laminators’ Dry Seal methodology to create a deep reveal look. This installation approach compartmentalizes the air cavity and allows for drainage and ventilation. The high-performance, pressure-equalized wall system reduces moisture-related issues within the wall cavity without caulk at the joints. 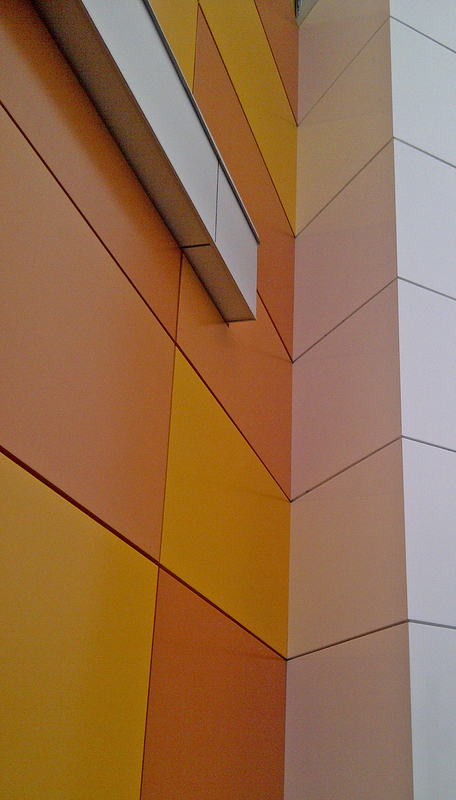 Supporting the panel system’s performance, Linetec applied PVDF architectural coatings that meet the industry’s stringent requirements set by the Americ an Architectural Manufacturers Association, AAMA 2605. This standard ensures the coatings exhibit outstanding resistance to humidity, color change, chalk, gloss loss and chemicals for long-lasting performance that requires minimal maintenance throughout the buildings’ lifespan. * Photos courtesy of: Laminators Inc.